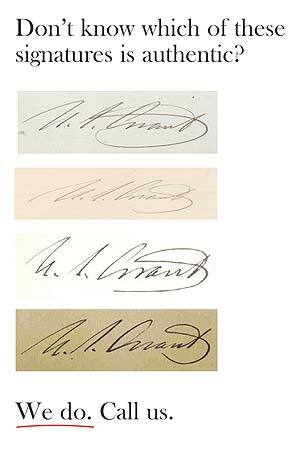 We provide authentication and grading services for a variety of historical autographs, letters, manuscripts, documents, photographs and rare signed books. Additionally we provide encapsulation, scoring and grading services for stock certificates, bonds, checks and autographs. We offer a no-nonsense approach to the very difficult issues faced by today’s collector. We have the experience to meet your needs. Our recognized industry experts, utilizing the latest technological advances along with their combined 100 plus years of “hands on” experience, bring you an unparalleled selection of authentication services. This assures you that your authentication and its accompanying PASS-CO PASS reflect the best qualified opinions in the industry. We offer prompt, professional and reliable authentication services at competitive prices. We also offer the first-of-its-kind financial guarantee, unique to the industry, and this guarantee stands behind every one of our authentications. Our pledge and our guarantee is that PASS-CO offers the finest authentication and grading service available. PASS-CO, the currency graders of choice for an expanding clientele. Over the course of the past year, we have expanded our currency grading activities at the request of numerous collectors who have shown a special loyalty to our services. In our endeavor to meet the stringent demands of our clientele, we have recently increased our grading staff in order to meet a growing demand for fair and consistent grading of currency. While we understand that alternatives to PASS-CO exist, we are proud to have become the grader of choice for this expanding group of dealers and collectors. Accept no more excuses. Have it PASS-CO certified!